Home / International Migration-India Bangladesh International Border / Indians are checked by the Indian frontier guard?s jawans. Indians are checked by the Indian frontier guard?s jawans. 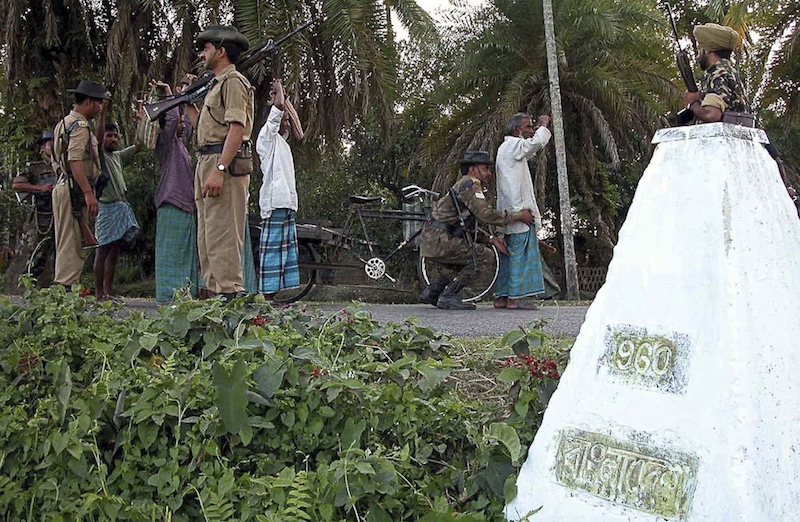 Caption: CAPTION : The jawans of the Indian Border Security Force are strictly checking with vigils on porous India-Bangladesh international border at Sahebganj (near international border pillar number-960), about 769 kilometres northeast of Calcutta, capital of North-Eastern Indian State of West Bengal, Sunday, May 02, 2004, before Parliamentary Election of India as precautionary measure, while West Bengal state shares the highest 02,217.70 kilometres international border with Bangladesh. Time to time firing between India and Bangladesh is going on 04,096.70 kilometres India-Bangladesh international border areas to check the flow of illegal Bangladeshi immigrants, Islamic fundamentalists activities, insurgency and smuggling activities into India that was provoked by Bangladesh.